Despite its clinical importance, the underlying neural mechanisms of itch sensation are poorly understood. In many diseases, pruritus is not effectively treated with antihistamines, indicating the involvement of nonhistaminergic mechanisms. To investigate the role of small myelinated afferents in nonhistaminergic itch, we tested, in psychophysical studies in humans, the effect of a differential nerve block on itch produced by intradermal insertion of spicules from the pods of a cowhage plant (Mucuna pruriens). Electrophysiological experiments in anesthetized monkey were used to investigate the responsiveness of cutaneous, nociceptive, myelinated afferents to different chemical stimuli (cowhage spicules, histamine, capsaicin). Our results provide several lines of evidence for an important role of myelinated fibers in cowhage-induced itch: (1) a selective conduction block in myelinated fibers substantially reduces itch in a subgroup of subjects with A-fiber-dominated itch, (2) the time course of itch sensation differs between subjects with A-fiber- versus C-fiber-dominated itch, (3) cowhage activates a subpopulation of myelinated and unmyelinated afferents in monkey, (4) the time course of the response to cowhage is different in myelinated and unmyelinated fibers, (5) the time of peak itch sensation for subjects with A-fiber-dominated itch matches the time for peak response in myelinated fibers, and (6) the time for peak itch sensation for subjects with C-fiber-dominated itch matches the time for the peak response in unmyelinated fibers. These findings demonstrate that activity in nociceptive, myelinated afferents contributes to cowhage-induced sensations, and that nonhistaminergic itch is mediated through activity in both unmyelinated and myelinated afferents. The sensation of itch can be elicited from the skin by a variety of stimulus modalities, including thermal, mechanical, electrical, and chemical. Histamine has been widely used to study the neuronal mechanisms of itch. However, antihistamines are ineffective in treating pruritus in many disease states (Twycross et al., 2003), suggesting that this itch is mediated through nonhistaminergic mechanisms. Recent experimental evidence demonstrated that intradermal insertion of spicules from the pods of a cowhage plant (Mucuna pruriens) induces itch through nonhistaminergic mechanisms (Johanek et al., 2007) and that the cysteine protease, mucunain, the active ingredient of cowhage spicules, activates the protease-activated receptor (PAR) 2 and 4 (Reddy et al., 2008). In electrophysiological recordings from afferent nerve fibers in humans, cats, and monkeys, pruritic stimuli activated unmyelinated C-fibers (Tuckett and Wei, 1987b; Handwerker et al., 1991; Schmelz et al., 1997, 2003; Johanek et al., 2008). In particular, cowhage and histamine excited mechano-sensitive, polymodal C-fibers (Tuckett and Wei, 1987b; Johanek et al., 2008; Namer et al., 2008), whereas histamine-sensitive mechano-insensitive C fibers were unresponsive to cowhage (Namer et al., 2008). Therefore, cowhage and histamine appear to activate different C-fiber populations. In addition to C-fibers, psychophysical experiments in humans (Graham et al., 1951; Handwerker et al., 1986; Magerl, 1991) suggest that activity in thinly myelinated Aδ-fibers may contribute to the sensation of itch. However, rigorous psychophysical and neurophysiological evidence for a functional role of A-fibers in the mediation of nonhistaminergic itch in primates is lacking. In addition, it has not been explored if C- and A-fibers mediate different qualities of the itch percept. A prevailing view is that peripheral nerve fibers mediating burning are C-fibers and those mediating pricking/stinging are Aδ-fibers. In psychophysical experiments, we used a selective conduction block of myelinated fibers to test the hypothesis that activity in A-fibers contributes to cowhage-induced itch. In electrophysiological recordings from primary afferents in the anesthetized monkey, we tested whether cowhage, histamine, or capsaicin activated high threshold A-fiber afferents. Fourteen subjects (7 female, 7 male) were each given two to four control tests with cowhage on the dorsum of the hand within the anticipated autonomous zone of the superficial branch of the radial nerve (in the region of the interosseus muscle and extending to the base of the thumb and adjacent two fingers). In each test, cowhage was applied by means of a spicule inserter that had a row of nine spicules attached by nail polish to the cut end of a WekCell surgical sponge (LaMotte et al., 2009). A lateral movement, approximately parallel to the surface of the skin, typically resulted in the insertion of the tips of 7 ± 1 spicules. A sensation was always evoked in the tests conducted before the block. Conduction in myelinated nerve fibers was blocked by the application of local pressure to the superficial radial nerve. The subject's arm rested on a horizontal holder and the hand grasped a vertical rod. A 2.5-cm-wide rubber band was draped over the wrist directly over the superficial branch of the radial nerve. The two ends of the band were attached to a hanging weight of 1.2 kg (Ziegler et al., 1999). The sustained pressure typically produced a selective block of conduction in myelinated nerve fibers without altering conduction in unmyelinated fibers, as evidenced by the following: the presence of sensation to warmth but absence of sensation to cool and touch, and a delay of ∼1 s in mechanically evoked pricking pain. Using the procedure described by Ziegler et al. (1999), a series of tests was delivered to the autonomous zone before, and then repeatedly 30 min after, the onset of the pressure. In two-alternative forced-choice tests, subjects were asked whether a light tactile stimulus (von Frey filament; tip diameter, 200 μm, exerting a bending force of 10 mN) appeared in the first or second of two designated intervals of time. In another test, the subject was asked whether cool or warmth was felt in response to the touch of each of two test tubes, one warmed to 40°C and one cooled to 4°C. In a third test, the subject was instructed to release a response key upon detecting the occurrence of pain elicited by a von Frey filament having a tip diameter of 100 μm and delivering a bending force of 140 mN. The response latency was measured as the elapsed time between contacting the skin with the filament tip (measured by recording an imperceptible current passed from the tip through the skin) and the key release. Evidence for a successful block, typically occurring after 1 h of pressure, was the loss of tactile and cool sensations and an increase in response latency (by ∼1 s) to pricking-evoked pain within the autonomous cutaneous zone of the nerve on the back of the hand (Ziegler et al., 1999). An intact sense of warmth indicated normal conduction in unmyelinated nerve fibers. At this time, the border of the sensory-blocked autonomous zone of the superficial radial nerve was identified and marked in ink using tactile and cool stimuli applied along radially organized tracks from outside to within. Then, cowhage spicules were inserted by means of the spicule inserter into the autonomous zone. The subjects rated the magnitude of itch, pricking/stinging, and burning every 30 s using the general version of the Labeled Magnitude Scale (Green et al., 1996; Sikand et al., 2009). These rating values were compared with those from when cowhage was delivered to the same skin area in the same subjects in the absence of the conduction block. For each subject and for each of the two experimental conditions, the rating of each quality was plotted as a function of time after the application of cowhage. From these data, the area under the curve and the peak magnitude of sensation were obtained for each of the three sensory qualities. Area under the curve and peak magnitude of sensation were analyzed with nonparametric tests (Wilcoxon matched pairs) as data were not normally distributed. Data are presented in the text as median (lower, upper quartile). Studies were approved by the Yale University Human Investigation Committee. Male cynomolgus monkeys (Macaca fascicularis), 4–7 kg, were sedated by intramuscular ketamine (12 mg/kg; Ketaject, Phoenix Pharmaceuticals). Intravenous catheterization was performed and anesthesia was induced using a 6 mg/kg pentobarbital bolus (Nembutal; Ovation Pharmaceuticals). Anesthesia was maintained by continuous pentobarbital infusion at 4–6 mg/kg/h. Core temperature was monitored and maintained near 38°C using feedback-controlled warm-water heating pads. Proper hydration and nutrition were maintained by a continuous intravenous drip of 5% dextrose. The heart rate was continuously monitored and depth of anesthesia was adjusted if tachycardia occurred in response to noxious stimuli. Animals were intubated, paralyzed with pancuronium (0.1 mg/kg every 2 h; SICOR Pharmaceuticals) and ventilated to maintain a pCO2 of 35–40 mmHg. Cefazolin (10 mg/kg/h; West-Ward Pharmaceutical) was used as prophylactic antibacterial agent. Postsurgically, animals received daily buprenorphine injections (0.15 mg per injection; Buprenex Injectable; Reckitt Benckiser Pharmaceuticals) for 2 d.
Nerves were dissected using aseptic techniques. A standard teased-fiber technique (Campbell and Meyer, 1983; Johanek et al., 2008) was then used to record neuronal activity in single afferent fibers. Saphenous, superficial peroneal, sural, superficial radial, and medial antebrachial cutaneous nerves were used. For each recording, a bundle of the dissected nerve was excised, leaving the distal end attached to the nerve trunk. Smaller strands of this bundle were split on a dissecting platform supporting the nerve trunk. The strands were placed on the recording electrode, situated in the near vicinity of the splitting platform. A stimulating electrode was positioned on the nerve ∼4 cm distal to the recording electrode to enable electrical stimulation of the nerve trunk. A second distal electrode was used to stimulate the identified neurons at their receptive fields. All experiments were performed in accordance with Animal Welfare Act regulations and the United States Public Health Service Policy on Humane Care and Use of Laboratory Animals and were approved by the Johns Hopkins University Animal Care and Use Committee. Afferent fibers were first identified by electrical stimulation of the nerve trunk. Single fiber activity was then determined by all or none activity following increasing constant-current pulses. The approximate location of the receptive field of the fiber was identified by gently squeezing the skin. Low-threshold mechanoreceptors (e.g., hair follicle; slowly adapting type I and II, etc.) were not included in this study. They were distinguished from nociceptors by their vigorous response to light touching of the skin. A detailed map of the circumference of the receptive field (RF) for the nociceptive fibers was determined using a 6-bar von Frey filament. The RF of mechano-insensitive units, which did not respond to squeeze and/or six bar, were mapped electrically using a ball electrode (maximum intensity: 100 mA, 2 ms duration). Stimulation at the RF typically required less current for fiber activation and conduction latencies decreased in discrete steps as stimulus intensity was increased compared with stimulation outside the RF where no latency steps could be obtained and a high-intensity stimulus was required for fiber activation (Peng et al., 1999). Conduction latencies were measured from the center of the RF and determined at 1.5 times the threshold for excitation at that spot. Fibers with a velocity of >2 m/s were considered A-fibers. Following mapping of the RF, mechanically sensitive spots (hot spots) were identified using a suprathreshold von Frey filament <6 bar. After a 2 min waiting period, the mechanical threshold was determined as the filament for which a minimum of two of four applications resulted in fiber activity. Units for which the threshold was >6 bar were classified as A-fiber mechano-insensitive afferents (A-MIAs). Next, the responsiveness to cold and heat were tested. Cold sensitivity was determined by applying a refrigerated (4°C) 15-mm-diameter brass bar to the skin for 15 s. If a response was obtained, a similar bar, maintained at room temperature, was applied to the skin 2 min later to test for a nonselective mechanical response. Two minutes after cold and/or room temperature probe application, a heat stimulus was delivered to the skin using a carbon dioxide laser (Meyer et al., 1976). A stepped heat stimulus (49°C for 1 or 3 s) was applied. If the fiber responded within 1 s of the stimulus onset, the afferent was considered a type II afferent (Treede et al., 1998); type I afferents were either nonresponsive or discharged >1 s after the heat stimulus onset. After a 10 min waiting period following the heat stimulus, fibers were tested for their response to cowhage. Cowhage (Mucuna pruriens) was kindly provided by Zandu Pharmaceuticals. Heat-inactivated cowhage, which does not produce itch in humans (Johanek et al., 2007; Sikand et al., 2009), served as control. First, the response of the unit to inactive cowhage was investigated. Next, active cowhage spicules were inserted into the RF and fiber activity was recorded. Typically, there were three trials with active cowhage. Fiber activity was recorded for a maximum of 20 min following cowhage application. Recordings were stopped after 5 min if no activity was obtained or when no activity was present in 3 consecutive minutes with a minimum of 5 min of observation. Cowhage spicules were inserted into the skin by pressing a fragment of the pod, with associated spicules, against the skin. In some instances, applicators, assembled by removing spicules from the pod and affixing them to a cotton-tipped applicator with nail polish, were used (Johanek et al., 2008). Fifteen seconds were allowed for inserting the cowhage spicules into the skin. The spicules remained in the skin during the recordings for a given trial. At the end of the trial, a microscope was used to count the number of spicules inserted into the skin. The average number of spicules inserted was 22 ± 2. The spicules were then removed using tape. At least a 2 min wait was allowed between spicule removal and the next trial with active cowhage. After testing with cowhage, units were tested for their response to saline, histamine, capsaicin vehicle, and capsaicin. Histamine (dihydrochloride salt) was dissolved in saline to obtain a final concentration of 0.1 or 1 mg/ml. Capsaicin was dissolved in saline using Tween 80 to obtain a final concentration of 1 mg/ml (LaMotte et al., 1991). Drugs were obtained from Sigma-Aldrich. The volume for all injections was 10 μl. Injections were aimed at mechanical hot spots; the site of entry of the needle introduced during injection of a control solution was reused for injection of the active substance to avoid leakage. Baseline activity was recorded for 1 min, the injection was made, and the response to injection was observed for up to 20 min. The same criteria as for cowhage-induced activity were used to determine if a unit was responsive to histamine and capsaicin. Action potentials (APs) were amplified and processed by the Digital Acquisition Processor board (Microstar Laboratories) for storage on a personal computer. The interface was operated using DAPSYS software (v.6, www.dapsys.net; Brian Turnquist) for Windows. The software allowed for action potential discrimination, action potential timing, timing of the events, manipulations that occurred during the recordings (e.g., start baseline, stop baseline, cowhage application), and control of the laser stimulus parameters. For each test or trial, the total number of APs after application of the test stimulus was corrected for baseline activity, i.e., the number of APs in the 1 min baseline preceding the test stimulus was subtracted from the test response prorated to the total duration of observation. Next, the net response was computed by subtracting the response of the control. If negative results were obtained because of the subtraction(s), responses were adjusted to zero, since these negative numbers have no physiologically relevant correlate. A unit was considered to be a responder to the active substance if the following two criteria were met: (1) the response before subtraction of the control response was at least twice that of the control, and (2) the net response was >10 APs/10 min. For cowhage responses, units were deemed responders if at least one of three trials fulfilled both criteria. Only the trial with the most vigorous response of a particular unit to active and/or inactive cowhage was considered for the computation of net responses and population responses. This approach was justified because cowhage spicules have very small tips (1–10 μm) and likely activate afferent fibers only when they are inserted in close proximity to nerve terminals. Hence, the variability of the cowhage response across trials in a given fiber likely reflects the variability in the distance between cowhage spicules and nerve terminals. Computing the average or median of the three trials would, under these circumstances, underestimate the response of the afferent fiber, and as such, the global population response to cowhage. In addition, histamine and capsaicin sensitivity were determined following intradermal injections, a situation in which many nerve terminals are exposed to the chemical. Comparisons of the magnitude of the response following spicule insertion and intradermal chemical injection are thus best made using the maximum cowhage response. The statistical analysis used to describe and analyze data is explained in Results, below. Data are presented as mean ± SEM or medians and percentiles, where appropriate. Statistical analysis was performed with Statistica 6.1 (StatSoft) and graphs were prepared with SigmaPlot 10.0 (Systat Software). We found that topical application of cowhage to the back of the hand in normal human subjects produced sensations of itch, pricking/stinging, and burning that peaked ∼1–4 min after application and diminished within 20 min (Fig. 1A). We wondered whether these sensations were signaled by activity in myelinated or unmyelinated afferent fibers. To test this, we used compression of the superficial radial nerve at the wrist to achieve a selective conduction block of myelinated fibers innervating the back of the hand, as indicated by the loss of the sensations of touch, cool, and fast pain to pin prick. During the selective blockade, the sensation of warmth was not affected, demonstrating that unmyelinated nerve fiber function was intact, but the sensations of itch, pricking/stinging, and burning were significantly reduced, indicating an involvement of myelinated fibers in these sensations [median (25th percentile, 75th percentile): itch area under the curve (AUC): 141.7 (55.1, 190.0) vs 36.4 (4.2, 109.4), p < 0.001; itch peak: 14.6 (11.1, 16.0) vs 6.0 (1.7, 9.9), p < 0.01; prick AUC: 105.6 (43.7, 157.5) vs 23.9 (1.9, 96.0), p < 0.05; prick peak: 17.7 (12.2, 35.1) vs 7.7 (1.4, 13.9), p < 0.01; burn AUC: 22.9 (1.0, 115.6) vs 7.8 (1.0,17.5), p < 0.05; burn peak: 6.4 (24.1,21.0) vs 2.0 (1.0, 4.0), p < 0.001; all comparisons were made with Wilcoxon matched pairs test; Fig. 1B]. Psychophysical studies of itch in normal human subjects. A, Average time course of itch, pricking/stinging, and burning sensations produced by topical application of cowhage spicules to the back of the hand (n = 14). B, Ratings of cowhage-evoked sensations decreased during a selective blockade of myelinated fiber function. C, Changes in peak itch and itch-AUC during selective myelinated fiber block. Subjects were considered to have an A-fiber-dominated itch if their itch decreased during the block such that their normalized AUC was <0.3 (n = 6, solid circles). Subjects with AUC > 0.4 were considered to have C-fiber-dominated itch (n = 8, open circles). Data during the block were normalized by dividing by the response before the block. D, In the absence of a nerve block, the average time course of itch sensation differs between subjects whose itch responded well to the selective myelinated fiber block (n = 6) and those that did not (n = 8). It became apparent that cowhage-induced sensations were greatly affected by the A-fiber block in some subjects but not in others. This suggests that the role of A- and C-fibers in itch sensation may vary between subjects. To assess the effects of the block on itch sensation, we determined how much the maximum itch rating and the itch AUC were changed by the block. Before the block, the magnitude of sensation produced by cowhage for an individual subject varied considerably from one application to another. This variability was assessed by computing the coefficient of variation (COV = SD/mean) for the AUC and maximum itch rating across the preblock trials for each subject. The average COV across subjects was 0.69 ± 0.07 for AUC and 0.63 ± 0.06 for peak itch. Based on these data, we required at least a 70% change in the itch response during the block for a subject to be considered to have an itch sensation that was dominated by activity in A-fibers. For each subject, the peak itch and itch AUC during the block were normalized by dividing by the individual's average data from sessions without the nerve block. Not surprisingly, the AUC data were highly correlated to the peak itch data (Fig. 1C). We defined subjects with A-fiber-dominated itch as those in which the area under the itch-time curve was reduced to <30% of the preblock levels. Using this criterion, six of the 14 subjects were considered to have A-fiber dominated itch; two of these subjects actually reported no cowhage-induced sensations (itch, prick, or burn) during the block. Surprisingly, the time course of itch sensation (before the block) for these six subjects differed significantly from that of the other eight subjects who we labeled as having C-fiber-dominated itch (Fig. 1D); notably, the peak itch sensation occurred earlier in subjects with C-fiber- rather than A-fiber-dominated itch (see Fig. 4B). These data suggest that myelinated fibers play an important role in itch sensation. We examined whether the demographics of these subjects were different. The subjects with A-fiber-dominated itch (32 ± 6 years) tended to be younger than those with C-fiber-dominated itch (44 ± 6 years; t test, p = 0.17). There was no preference for gender since half of the subjects in each group were male. Recordings were made from 57 high-threshold, A-fiber afferents. Their average conduction velocity was 19.1 ± 1.5 m/s. Forty-one fibers were mechano-sensitive afferents (A-MSA) with von Frey thresholds <6 bars (average: 2.4 ± 0.2 bar). Sixteen units had mechanical thresholds ≥8.6 bars and were therefore classified as A-MIA. The mean conduction velocity of A-MSAs was higher than of A-MIAs (22.8 ± 1.7 m/s vs 10.0 ± 1.7 m/s; p < 0.001, t test), which is in agreement with previous findings (Treede et al., 1998). In the majority of units (n = 45), heat-inactivated cowhage spicules elicited only a minimal response of ≤4 APs in the observation period of 10 min. In nine mechano-sensitive and one mechano-insensitive afferent, 9–87 action potentials were observed; two additional mechano-sensitive afferent fibers had an unusually high discharge with 258 and 402 APs, respectively, during exposure to inactive cowhage spicules. Examples of responses to inactive cowhage are presented in Figure 2, B and D. We do not know what accounts for the excitation following insertion of inactive cowhage spicules. It may be that mucunain was not completely inactivated. Alternatively, excitation may be due to skin injury produced by repetitive application of cowhage spicules or a spicule-induced degranulation of mast cells. Cowhage activates mechano-sensitive, nociceptive A-fibers. Electrophysiological recordings were performed from nociceptive, myelinated afferents in monkeys. A, This myelinated afferent responded during the application of cowhage (41 spicules) to the RF (gray bar), presumably due to the mechanical stimulation associated with insertion of the spicules. Approximately 1 min after application, the fiber was activated. The response slowly decreased over the 10 min observation period. The discharge rate was irregular throughout the observation period. The total response of this fiber during the 10 min after active cowhage application was 559 APs. Each dot corresponds to an AP. Insert, Expanded time course of response 5.5 to 6 min after spicule insertion (vertical line corresponds to time of AP). B, Response of the same afferent to the prior application of inactive cowhage (40 spicules). Spicule application induced a short-lasting activation of the afferent and also some activity during the 10 min observation period. The total response of this fiber during the 10 min after inactive cowhage application was 54 APs. Insert, Action potential waveforms for the first 20 sequential APs after spicule insertion. C, This myelinated afferent responded to cowhage (21 spicules) with a bursting discharge. The instantaneous frequency varied between ∼0.1 and 100 Hz. The total response during the 10 min observation period was 170 APs. Insert, Expanded time course of response at indicated times (vertical line corresponds to time of AP). The bursting nature of the response is evident. D, Response of the same afferent as in C to the application of inactive cowhage (16 spicules). Only a single AP occurred during the 10 min after inactive cowhage application. Insert, Action potential waveforms for the first 20 sequential APs obtained during spicule insertion. Gray bar indicates the cowhage-application period. E, Average response of myelinated fibers to cowhage. Only those fibers that met the criteria for an evoked response are included (n = 23). The response to active cowhage (solid circles) was substantially greater than to inactive cowhage (open circles; mean ± SEM, bin size = 30 s). F, Responses to cowhage are variable. The responses to inactive and subsequent responses to active cowhage are shown for the 23 cowhage-responsive fibers. Each line corresponds to the response of one fiber. The magnitude of the responses varied within fibers (i.e., across trials) and also between fibers. There was not a significant change in the median response (red line) between trials and thus no obvious signs of tachyphylaxis or sensitization of the response to active cowhage. Twenty-three of 57 units (22 MSA, 1 MIA) responded to active cowhage. For the typical afferent shown in Figure 2A, brief discharges were observed at the time spicules were applied to the receptive field due to mechanical stimulation of the afferent. For this fiber, the cowhage-induced activity started abruptly ∼1 min later, reached peak instantaneous frequencies of 4–7 APs/s, and then slowly declined over the 10 min observation period. In four afferents, a high-frequency (i.e., >17 Hz) bursting discharge to cowhage was observed. For the example illustrated in Figure 2C, the instantaneous frequency during the burst (∼10–100 Hz) was substantially higher than the interburst frequency (∼0.1–1.0 Hz). For the first 5 min, the response in this fiber was mainly doublets (instantaneous frequency range between 35 and 100 Hz) that occurred intermittently (at interburst intervals ranging from 8 to 50 s). Approximately 5 min into the trial, the response increased dramatically with high-frequency bursts containing two to six APs and interburst intervals of <10 s. The bursting discharge continued throughout the 10 min observation period. The average response for the population of myelinated afferents responsive to cowhage (Fig. 2E) reached a broad peak of 39–44 APs/30 s at 1.5–3 min after the application and then decreased over the remainder of the 10 min recording period. Topical application of spicules that had been heated to inactivate the protease did not produce itch in humans (Johanek et al., 2007; Sikand et al., 2009) and did not produce a substantial response in these afferents beyond the moment of insertion (Fig. 2E). The cowhage response varied considerably between trials. For example, in 13 of 22 cowhage responsive A-MSAs, at least one of the three active cowhage trials resulted in a negative response, i.e., it did not fulfill the criteria for a cowhage response. These negative trials occurred either as the first, second, or third trial. Consequently, the average response across fibers did not differ between the three consecutive trials (Fig. 2F). It is thus unlikely that tachyphylaxis or desensitization to cowhage contributes to the variability in the response to cowhage. The variability in stimulus application likely accounts for most of the response variability, since the number of cowhage spicules inserted, insertion depth, and insertion location could not be controlled. In line with this interpretation is the lack of correlation between the number or cowhage spicules inserted into the skin and the magnitude of the cowhage response (R2 = 0.07). The proportion of MSA fibers that were responsive to cowhage (22 of 41) was significantly greater than for MIA fibers (1 of 16, χ2 test, p < 0.01). For the MSAs, neither von Frey threshold, sensitivity to cold, or response characteristics to a 49°C stimulus (type I vs II) allowed for the prediction of cowhage responsiveness (r2 < 0.5). Six cowhage responsive MSAs showed a type I heat response, eight showed a type II response, and three were unresponsive (in the remaining five MSAs, heat was not tested). Three cowhage-responsive and six cowhage-insensitive MSAs were cold sensitive. After testing cowhage, recordings in 53 units (38 MSAs and 15 MIAs) were sufficiently stable to allow for testing with 10 μl intradermal injections of saline and histamine. Mechanical stimulation by needle insertion and intradermal injection activated most mechanically sensitive afferent fibers investigated. Postinjection, saline produced less then 11 APs/10 min in all histamine responsive units, except one. This unit exhibited a rather large response to saline (65 APs in 10 min), yet its response to histamine was almost triple (189 APs/10 min). Sixteen units (12 A-MSA, 4 A-MIA, one of which was not studied further with capsaicin) were activated by histamine (10 μg/10 μl), and none responded to the lower dose (n = 4). Their net response, following correction for baseline activity and subtraction of the saline response, averaged 59 ± 14 APs/10 min. 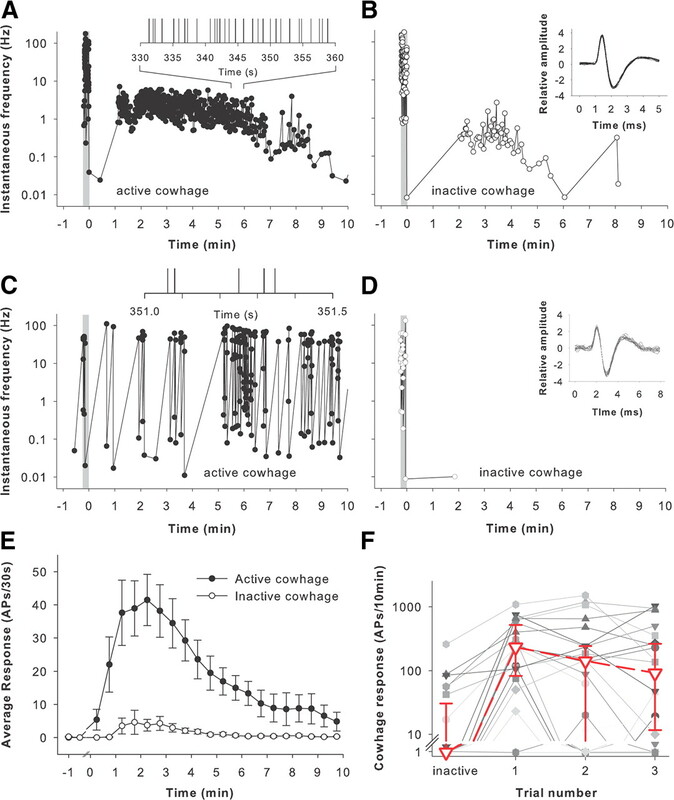 Histamine-induced activity was present either within 4 s following injection (n = 5, 4 MSA and 1 MIA) or delayed for at least 22 s (n = 11, 8 MSA, 3 MIA), with an average delay of 54 ± 9 s. The histamine response could not be predicted by the response of the afferent fiber to a 49°C heat (type I, II, or A-MSA) or cold stimulus, or by its mechanical threshold (r2 < 0.5). A total of 50 fibers were tested with capsaicin and its control following the injection of histamine. Vehicle injection elicited <4 APs/10 min in capsaicin-responsive fibers. Four MSA and five MIA afferents responded to the intradermal injection of capsaicin (10 μg). Their net response ranged from 10 to 212 APs/10 min, averaging 61 ± 24 APs in 10 min. The onset of response was either immediate (<0.3 s, n = 3, 1 MSA and 2 MIA) or late (127 ± 44 s after capsaicin injection, n = 6, 3 MSA and 3 MIA). The immediate capsaicin responders exhibited short-lived activity, i.e., >90% of their APs occurred within 40 s following the injection. Afferents with a delayed response showed bursts of activity (n = 3) or a more regular and persistent discharge pattern (n = 3). Four of the capsaicin responders showed a type II heat response, three were unresponsive, and the remaining two afferents were not tested with heat. The Venn diagram in Figure 3A illustrates the proportion of fibers that responded to each agent. Of these fibers, 12 responded only to cowhage, seven responded only to histamine, four responded only to capsaicin, and nine responded to more than one agent. The median response to cowhage was significantly greater than the response to histamine and capsaicin (Fig. 3B). The presence of a response to cowhage or its magnitude did not predict the responsiveness to histamine (Fig. 3C), suggesting that cowhage and histamine induce neuronal activity through different mechanisms. Comparison of responses to cowhage, histamine, and capsaicin. A, Venn diagram indicating incidence of response to topical cowhage and intradermal injection (10 μl) of histamine (10 μg) and capsaicin (10 μg) for 50 high-threshold, myelinated fibers tested with all three substances. Number in parentheses indicates number of fibers that were insensitive to mechanical stimuli. 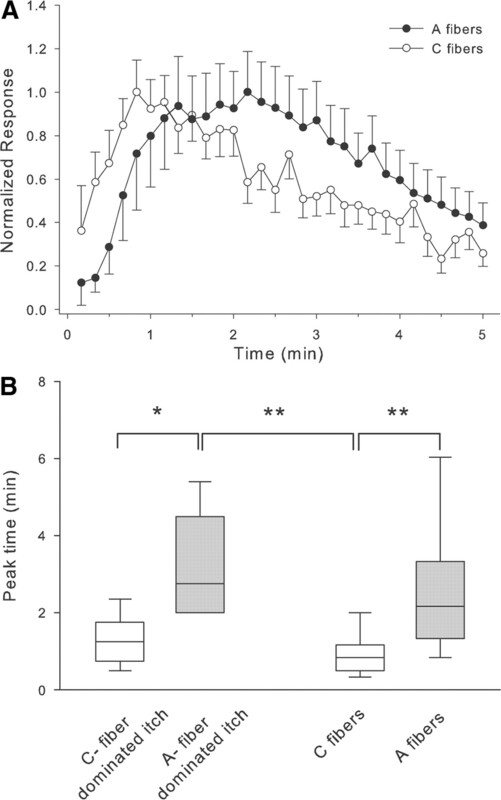 B, Net response during the 5 min observation period following administration of cowhage, histamine, and capsaicin to the receptive field of myelinated fibers (shaded bars) and unmyelinated fibers (open bars; median with quartiles and 5/95% percentiles). In A-fibers, the median cowhage response (184 APs/5 min) was approximately seven times larger than the median response to histamine (25APs/5 min) or capsaicin (27.5 APs/5 min) (Kruskal–Wallis ANOVA, p < 0.001, followed by multiple Mann–Whitney U tests, corrected for multiple comparisons, *p < 0.05, **p < 0.01). Within the C-fiber class, the response to cowhage was significantly larger than the response to histamine (Kruskal–Wallis ANOVA, p < 0.05, followed by Mann–Whitney U test, #p < 0.05). In A- and C-fibers, the response magnitudes to histamine and capsaicin were similar, but the cowhage response was significantly larger in A- than in C-fibers (***p < 0.001, Mann–Whitney U test). For this analysis, mechano-sensitive and -insensitive afferents were pooled, and only responders were included. C, Cowhage and histamine responses are not correlated. The magnitude of the cowhage and histamine net response in units that were tested with both pruritic stimuli did not correlate. Units responsive to either cowhage or histamine had variable response magnitudes, the cowhage responses being larger overall (note different scales on the x- and y-axes). These data suggest that different cellular signaling mechanisms are engaged by histamine and cowhage. Net response: response to active agent minus response to control; negative results were assigned zero. In a previous electrophysiological study (Johanek et al., 2008), we used a similar protocol to investigate the properties of 43 mechano-heat-sensitive unmyelinated afferents. The cowhage response of these unmyelinated afferents was significantly less than the response in myelinated afferents (Fig. 3B). Data were not normally distributed and therefore analyzed with nonparametric tests. In A-fibers, the median cowhage response (184 APs/5 min) was approximately seven times larger than the median response to histamine (25APs/5 min, p < 0.01) or capsaicin (27.5 APs/5 min, p < 0.05) (Kruskal–Wallis ANOVA, p < 0.001, followed by multiple post hoc comparisons). Within the C-fiber class, the responses to cowhage, histamine, and capsaicin were significantly different (Kruskal–Wallis ANOVA, p < 0.05) and the response to cowhage was significantly larger than the response to histamine (Mann–Whitney U test, p < 0.05). In A- and C-fibers, the response magnitudes to histamine and capsaicin were similar, but the cowhage response of A-fibers was >3 times the response of C-fibers (medians: 184 APs/5 min and 52 APs/5 min, respectively; p < 0.001, Mann–Whitney U test). In addition, the time course of the response was also quite different (Fig. 4A); for unmyelinated fibers, a substantial discharge occurred in the first 10 s and the peak discharge occurred within the first minute, whereas for the myelinated fibers, the discharge started ∼30 s after cowhage administration and the peak discharge was much later. Notably, the average time of the peak discharge for the unmyelinated afferents was comparable to the average time of the peak itch in the subjects with C-fiber-dominated itch, whereas the average time of the peak discharge in myelinated fibers was comparable to the average time of the peak itch in the subjects with A-fiber-dominated itch (Fig. 4B). Comparison of the time course of responses to cowhage. A, The peak response of the unmyelinated fibers (open circles) occurred earlier than in myelinated fibers (filled circles). For each fiber, the response at a given time point was normalized by dividing by that fiber's maximum response. B, The peak itch sensation in subjects with A-fiber-dominated itch occurred significantly later than in subjects with C-fiber-dominated itch. Similarly, the peak response to cowhage occurred later in myelinated fibers than in unmyelinated fibers (Kruskal–Wallis ANOVA, p < 0.001 followed by multiple Mann–Whitney U tests corrected for multiple comparisons, *p < 0.05, **p < 0.01). Medians, quartiles and 5/95% percentiles are plotted. In summary, we provide several lines of evidence that myelinated fibers play an important role in itch sensation produced by cowhage. First, a selective conduction block in myelinated fibers substantially reduces itch in a subgroup of subjects. These subjects have A-fiber-dominated itch. Second, the time course of itch sensations differs between subjects who have A-fiber-dominated itch and those who have C-fiber-dominated itch (i.e., itch that did not significantly decrease during block). Third, cowhage activates a subpopulation of myelinated and unmyelinated afferents in monkeys. Fourth, the time course for response to cowhage is different in myelinated and unmyelinated fibers. Fifth, the time of peak itch sensation in subjects with A-fiber-dominated itch matches the time for peak response in myelinated fibers. 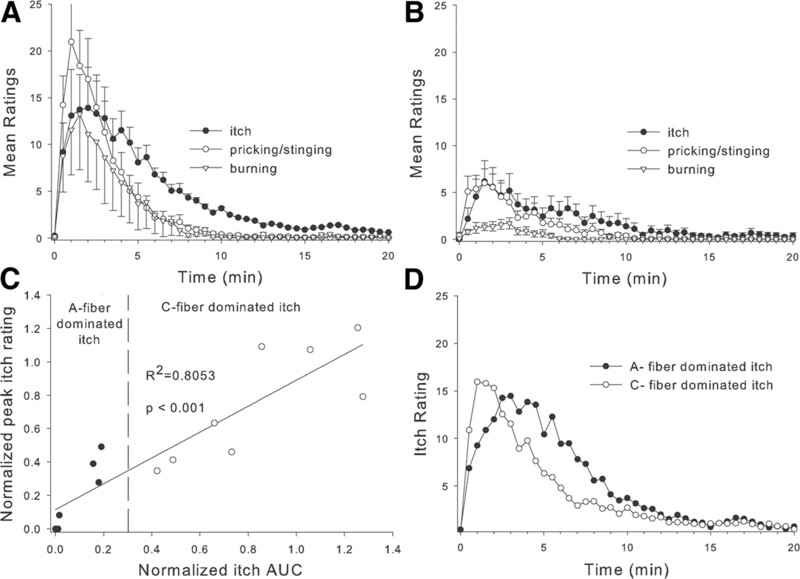 And sixth, the time for peak itch sensation for subjects with C-fiber-dominated itch matches the time for the peak response in unmyelinated fibers. In our psychophysical studies, cowhage-induced pricking, burning, and itching were all reduced by ∼50% when conduction in A-fiber afferents was blocked. Therefore, neuronal activity in A-fiber afferents contributes to cowhage-induced itch, which is in agreement with a previous report (Graham et al., 1951). While Graham and colleagues (1951) found that the fast, pricking itch sensation produced by cowhage was eliminated during an A-fiber block and the slow, burning itch sensation produced by cowhage was eliminated during a C-fiber block, we found all cowhage-induced sensations (i.e., itching, pricking, burning) being attenuated by a conduction block in small myelinated afferents. An incidental block of unmyelinated afferent nerve fibers is unlikely to contribute to the attenuation of burning sensations in our experiments, as the sensation of warmth was intact in our subjects when cowhage-induced sensations were tested. We do not know what accounts for the fact that input from myelinated fibers appears to dominate cowhage-induced itch sensation in a subpopulation of subjects. That these subjects tended to be younger is consistent with a previous finding that myelinated fiber-mediated heat-pain sensation is decreased in the elderly population (Chakour et al., 1996). Regional variations in the relative skin innervation densities of myelinated versus unmyelinated afferents may also play a role. Sensations evoked by spicules inserted at a location predominantly innervated by C-fibers would show little or no reduction during the block. Conversely, most or all sensations would be blocked if mainly A-fibers innervated the test area. Equal innervation by both fiber types would result in a partial reduction. In rats (Martin and Tuckett, 1990), but not in cats (Tuckett and Wei, 1987a), cowhage and/or histamine iontophoresis produced a significant response in A-fiber nociceptors. However, only mechano-sensitive afferents were investigated in those studies; noxious chemical stimuli were not tested. In our study, approximately half of the A-MSAs were excited by active cowhage, whereas only one A-MIA responded. A similar dichotomy has previously been observed in cowhage responses of unmyelinated C-fiber afferents (Johanek et al., 2008; Namer et al., 2008). One possible explanation for this dichotomy is that receptive terminals of mechano-sensitive and mechano-insensitive afferents are situated at different skin depths, with terminals of MIAs being located deeper in the skin and therefore out of reach of intradermally inserted cowhage spicules. Alternatively, the transduction mechanisms engaged by cowhage may be expressed preferentially in specific subclasses of afferents. Mucunain, the active ingredient in cowhage, activates PAR 2 and 4 (Reddy et al., 2008), and these are expressed in primary afferent medium and small sized neurons (Dai et al., 2004; Asfaha et al., 2007; Russell et al., 2010; but see Zhu et al., 2005). However, it is currently unclear if the expression of PAR 2 and 4 is restricted to only mechano-sensitive small myelinated and unmyelinated afferents. 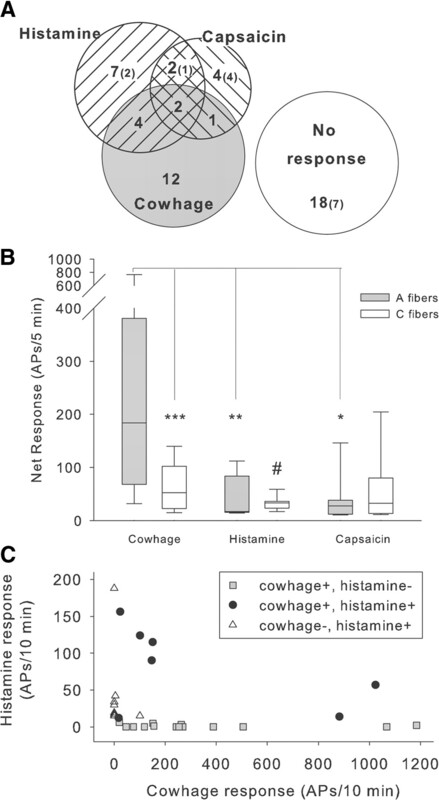 Responses of myelinated afferents to cowhage and histamine were not correlated, and a substantial number of A-MSA fibers exclusively responded to cowhage or histamine. Both findings suggest that cowhage and histamine activate small myelinated afferents through different mechanisms, corroborating a similar finding observed in unmyelinated afferents (Johanek et al., 2008). Intradermal injection of histamine not only causes itch sensation, but also short-lasting nociceptive sensations such as pricking and burning (Atanassoff et al., 1999; Sikand et al., 2009). The A-fiber afferents showing an early excitation by histamine injection may be involved in mediating these nociceptive sensations. In contrast, a number of A-fibers exhibited a delayed histamine response that peaked ∼2 min and decreased over 10 min following injection. It is unclear what accounts for the delayed histamine response in these afferents, and excitation due to secondary histamine effects are likely (e.g., histamine-induced degranulation of mast cells). However, this time course of excitation parallels the time course of itch sensation found previously following histamine administration (Simone et al., 1987; Schmelz et al., 1997). Furthermore, an A-fiber block diminishes histamine-induced itch sensation (Handwerker et al., 1986; Magerl, 1991). It is therefore likely that the delayed, histamine-induced activity in A-fibers contributes to histamine-induced itch sensation. Some A-afferents were also found to be responsive to intradermal injection of capsaicin. Although approximately half of the capsaicin responsive afferents had a type II heat response, capsaicin responsiveness was also observed in a few afferents that had either a type I heat response (n = 1) or no heat response (n = 2). These findings are in agreement with a previous study, in which capsaicin responsiveness was observed in heat-responsive and -unresponsive afferents (Ringkamp et al., 2001). Similar to the responses to histamine, A-fibers showed early and late responses to capsaicin injection. Spots of mechanical, heat, and chemical sensitivity may not coincide within the receptive fields of A-afferents (Ringkamp et al., 2001). A delayed response to capsaicin (or histamine) suggests that the observed excitation is due to capsaicin diffusing away from the injection site, activating capsaicin (histamine)-sensitive terminals in skin surrounding the injection site. As an A-fiber block does not diminish pain produced by capsaicin injection, this pain is thought to be mediated by activity in unmyelinated afferents (Ziegler et al., 1999). Cowhage-induced itch is almost completely abolished in capsaicin-desensitized skin (Johanek et al., 2007), demonstrating that it is mediated through capsaicin-sensitive nerve fibers. Consistent with this observation, transient receptor potential vanilloid 1-expressing neurons are responsible for itch produced by imiquimod (Liu et al., 2010; Kim et al., 2011) or chloroquine (Liu et al., 2009). Despite our observation that only three cowhage-sensitive myelinated fibers met the criteria for an evoked response to capsaicin, many myelinated fibers became desensitized to cutaneous stimuli after the injection. The lack of a response to the intradermal injection of capsaicin does not rule out capsaicin sensitivity in these afferents. For example, most heat-sensitive polymodal nociceptors did not respond to intradermal injection with capsaicin (Johanek et al., 2008). However, these afferents respond vigorously to capsaicin that is deposited into the skin via capsaicin-coated, heat-inactivated cowhage spicules (Ringkamp et al., 2010). Currently, it is unknown if cowhage-sensitive A-MSAs are responsive to capsaicin applied in such a manner. It may be that intradermal injection leads to rapid desensitization without a significant evoked response. A-fibers responded more vigorously to cowhage spicules than to histamine and capsaicin, and the cowhage response in A-fibers was significantly larger than the cowhage response previously observed in C-fiber afferents. Responses to histamine and capsaicin did not differ between C- and A-fibers. Several factors could explain the difference in cowhage sensitivity between A- and C-fibers. One, A-fibers may terminate in more superficial skin layers than C-fiber afferents. Two, PAR 2 and 4, the suggested transduction proteins for mucunain (Reddy et al., 2008), the active ingredient in cowhage spicules, may have higher expression levels in cutaneous terminals of A- than in C-fiber afferents. And three, PAR coupling to G-proteins may differ between A- and C-fibers. The difference in peak discharge time for A-fibers and C-fibers likely reflects differences in the kinetics of activation by mucunain. A number of A-MSAs exclusively responded to either cowhage or histamine. Such pruritic-specific units have not been observed among mechano-sensitive C-fibers (Johanek et al., 2007; Namer et al., 2008). This finding suggests that A-MSAs are able to provide pruritic specific input, which may contribute to the segregation of histamine- and cowhage-responsive polymodal spinothalamic tract cells reported previously in nonhuman primates (Davidson et al., 2007). Psychophysical experiments, using the same differential nerve fiber block as in this study, have demonstrated that pain to punctate stimuli is mediated by activity in capsaicin-insensitive, mechano-sensitive A-afferents (Magerl et al., 2001). In contrast, cowhage-induced itch is almost completely abolished in capsaicin-desensitized skin (Johanek et al., 2007), demonstrating that cowhage-induced itch is mediated through capsaicin-sensitive nerve fibers. These findings suggest that capsaicin-insensitive and capsaicin-sensitive A-MSAs exist, and that only the later group is involved in cowhage-induced itch. This work was supported by National Institutes of Health Grant P01 NS 47399. (2007) Protease-activated receptor-4: a novel mechanism of inflammatory pain modulation. Br J Pharmacol 150:176–185. (1999) Enhancement of experimental pruritus and mechanically evoked dysesthesiae with local anesthesia. Somatosens Mot Res 16:291–298. (1983) Sensitization of unmyelinated nociceptive afferents in the monkey varies with skin type. J Neurophysiol 49:98–110. (1996) The effect of age on Aδ- and C-fibre thermal pain perception. Pain 64:143–152. (2004) Proteinase-activated receptor 2-mediated potentiation of transient receptor potential vanilloid subfamily 1 activity reveals a mechanism for proteinase-induced inflammatory pain. J Neurosci 24:4293–4299. (1986) in Fine afferent nerve fibers and pain, Quantitative evaluation of itch sensation, eds Schmidt RF, Schaible HG, Vahle-Hinz C (Weinheim, New York), pp 461–473. (2011) Analysis of cellular and behavioral responses to imiquimod reveals a unique itch pathway in transient receptor potential vanilloid 1 (TRPV1)-expressing neurons. Proc Natl Acad Sci U S A 108:3371–3376. (1991) Neurogenic hyperalgesia: Psychophysical studies of underlying mechanisms. J Neurophysiol 66:190–211. (2010) Toll-like receptor 7 mediates pruritus. Nat Neurosci 13:1460–1462. (1991) The neurophysiology of itching. Allergologie 14:395–405. (2001) Roles of capsaicin-insensitive nociceptors in cutaneous pain and secondary hyperalgesia. Brain 124:1754–1764. (1990) Differential response characteristics of cutaneous Aδ and C fiber mechanonociceptors to pruritic stimuli. Pain 41(Suppl 1):S134. (1976) A laser stimulator for the study of cutaneous thermal pain sensation. IEEE Trans Biomed Eng 23:54–60. (1999) Electrophysiological assessment of the cutaneous arborization of A-delta-fiber nociceptors. J Neurophysiol 82:1164–1177. (2001) Capsaicin responses in heat-sensitive and heat-insensitive A-fiber nociceptors. J Neurosci 21:4460–4468. (2010) Unmyelinated polymodal nociceptors in monkey respond to “punctate” stimulation with capsaicin. Soc Neurosci Abstr 36:584–6. (2010) Proteinase-activated receptor-4 (PAR4) activation leads to sensitization of rat joint primary afferents via a bradykinin B2 receptor-dependent mechanism. J Neurophysiol 103:155–163. (1998) Myelinated mechanically insensitive afferents from monkey hairy skin: heat-response properties. J Neurophysiol 80:1082–1093. (1987a) Response to an itch-producing substance in cat. I. Cutaneous receptor populations with myelinated axons. Brain Res 413:87–94. (1987b) Response to an itch-producing substance in cat. II. Cutaneous receptor populations with unmyelinated axons. Brain Res 413:95–103. (2003) Itch: scratching more than the surface. QJM 96:7–26. (2005) Expression of mRNA for four subtypes of the proteinase-activated receptor in rat dorsal root ganglia. Brain Res 1041:205–211. (1999) Secondary hyperalgesia to punctate mechanical stimuli: central sensitization to A-fibre nociceptor input. Brain 122:2245–2257.